Dry roast them. I Microwave them for 40-45 second.Then Crush them into a fine smooth powder. 1. Wash the meat and drain out the water well . Now marinate the meat with all the ingredients , except sliced onion and oil. 2. Heat oil in the pot . Add the sliced onion and fry them until brown . Don’t make it too dark , u may end up cooking dark colored beef bhuna . The color of the meat depends on this. So fry them until they are brown . In Bangla what we call “bereshta” or fried onion. 3. Now add the meat with marinade into the pot . Mix well with bereshta . Give 1/4 th cup of water and cover the lid . Cook the meat on medium-low flame for about 20/30 minutes or until the water is dried out . The meat will release water . So wait until the water dries out . Cook well, adding water little by little . Don’t burn the meat on the bottom, so be careful . Check every 10 minutes . But you have to cook well adding water little by little , what we call in Bangla “Koshano”. The flavor of bhuna beef depends on this “koshano”. I do it for at least 1 hour . 4. After one hour of “Koshano” , add enough hot water to cover the meat . Cover the lid and let it cook on medium flame until the meat is tender and the gravy comes to desired consistency.Put it on very low flame for another 5 minutes ( which we call to keep on dom) , oil will separate. Turn off the stove and put the meat on the stove with lid on . 1. Raw papaya is meat tenderizer, so you may add 2 tbl spoon of papaya paste to the recipe. 3. Some like the dry roasted cumin flavor in their curry. You may add few pinches ofdry roasted cumin powder at the end, but be careful , you ruin the color and flavor of the meat if added more. 4. 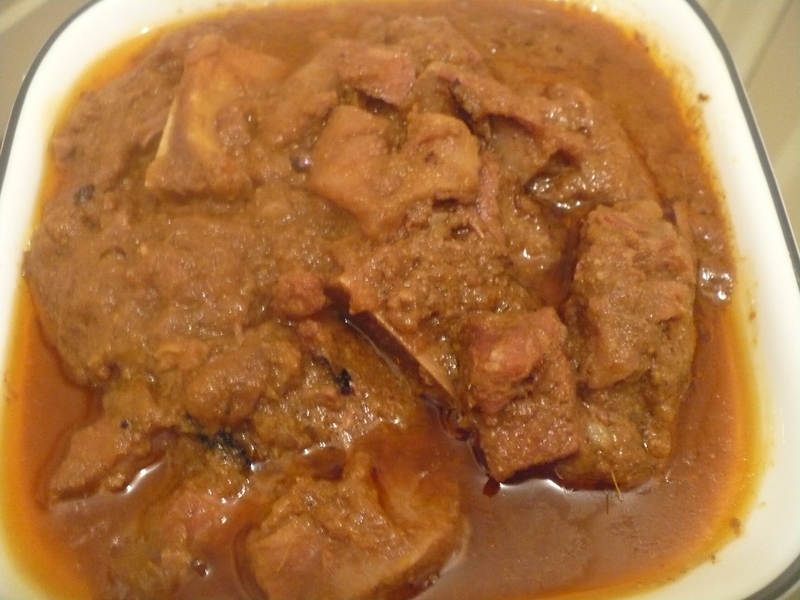 The taste of the beef bhuna or curry depends on how long you cook it . “Koshano” is very important . My Mom’s beef bhuna is very famous and she taught me that one magic trick of mind blowing flavor of Beef bhuna, and the trick is “Koshano”. The more ” Koshano” , the More ” Moja” ( tasty) . Do it for at least 1 hour . The more the better !!!!!!!! This entry was posted in Beef, Glossary / Notes, Meat. Bookmark the permalink. nice recipe, khadiza..special garam masala die tahole merinate korbo? mane shon eksathe except oil and beresta? ameen to ur dua ..jazakAllah khairan , thank u so much .. .. Thanks. But you did not mention how long to marinate. By the way can i add some joyfol / joyotry. Hi Khadizia, Have been following your blog for quite some time. Could you please post some authentic bangla pork recipes ??? SALAMS, IS IT NO NEED FOR TOMATOES? Apu, can i add sour yoghurt at the time of marinate? I prepared the Bhuna Beef as per your recipe and it turned out excellent. The best part is the preparation of the Garam Masala, it really gave the authentic Bhuna Beef flavour. Thanks a lot for sharing such a wonderful recipe. My guests were licking their fingers and I was thanking you silently. I wish to learn a good recipe of Biriyani. Please keep me posted. Apu can we use “tok doi” as tenderizer?